Learn about both the benefits and drawbacks of using popular PLA materials for your 3D printing needs. 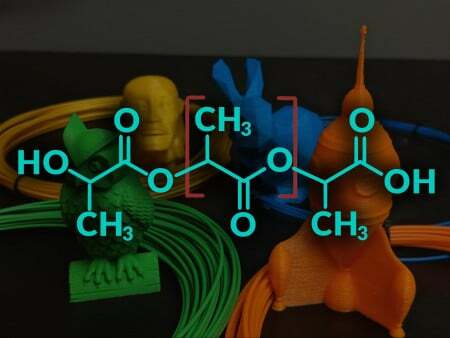 Polylactic acid (PLA) is one of the most widely used materials in 3D printer filaments. This is because PLA combines affordability, ease of printing and mechanical properties, making it an easy default option. The material is also useful in a wide range of applications—although it isn't necessarily the best option for any specific application. PLA is one of the least demanding filaments to print. It prints at relatively low temperatures and doesn't require a heated bed or any special storage considerations. To check out how to get your 3D designs ready to print, check out our how-to on using Tinkercad to create projects. 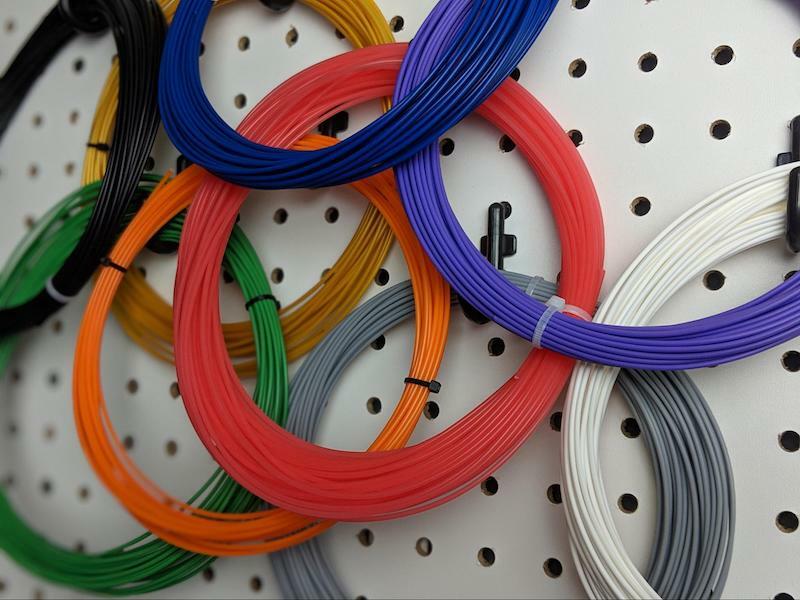 In its pure form, PLA is available in a variety of colors and multiple vendors. It's often used as the base material in many more specialized 3D printer feedstocks, such as metal-filled, wood-filled, glow-in-the-dark and filaments with additives for higher mechanical strength, higher temperature tolerances and better machinability. Several bundles of PLA filament in various colors. 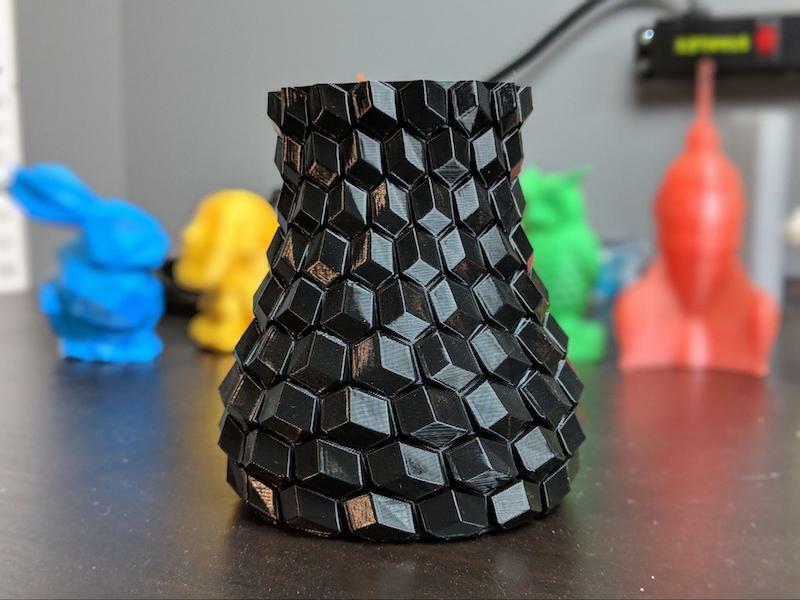 Bar chart measuring PLA material benefits. PLA is considered an attractively affordable 3D printing material. It ranges in price from $15 to $30 per kg, which makes it slightly cheaper than the second most common 3D printing feedstock, acrylonitrile butadiene styrene (ABS), and half the price of nylon. Higher priced suppliers typically have better dimensional tolerances and less common color choices. Image showing how to measur the dimensions of a PLA filament. Chart of PLA brand prices and dimensional tolerance specifics for PLA materials. A dimensional tolerance of ± 0.05 mm may sound good, but the advantages of higher priced but more consistent filaments become more obvious when the chart is extended further to include the variation in the cross-sectional area among the differently priced filaments. 3D printers rely on consistency in filament cross-sectional area to determine exactly how much plastic is extruded. 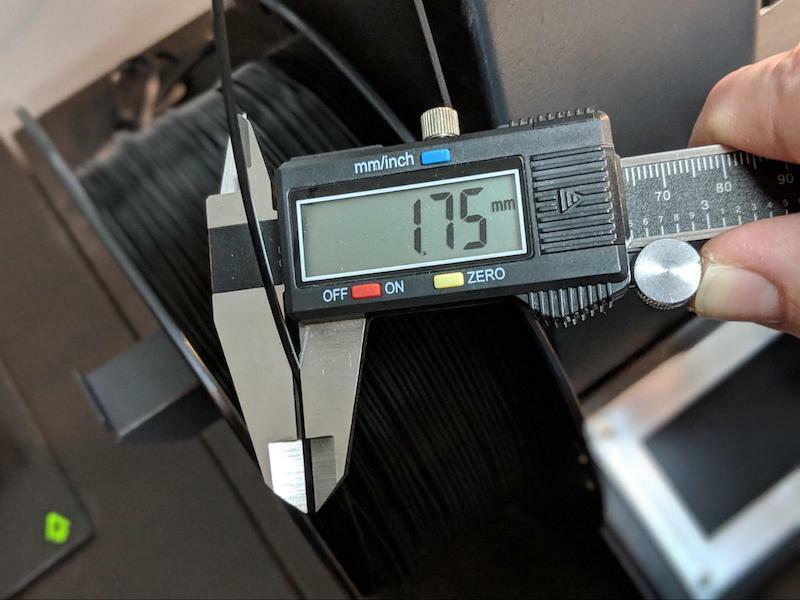 From a nominal 2.40mm2 cross-sectional area for filaments with a diameter of exactly 1.75mm, the budget filament can have variations of ±11% in diameter. This means, at any given time during a print job, if you use the cheapest filament, your printer may be extruding up to 11% too much, or too little. This variation can have a noticeable effect on print quality. Chart listing specifics to consider in purchasing PLA materials from Amazon Basics, Hatchbox, or Prusament brands. 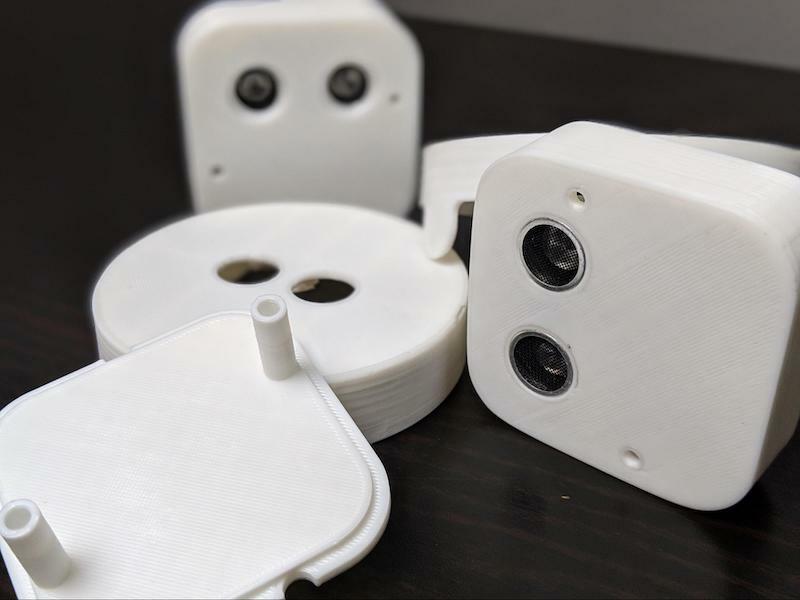 When it comes to the mechanical strength and the durability of parts printed from PLA, there are several considerations depending upon the types of parts being created. On one hand, PLA is very stuff, meaning that it can support large loads without deforming. On the other, its brittle so it doesn't cope well with impacts. PLA parts have a tendency to crack more easily when subjected to an impact compared with other types of plastic. 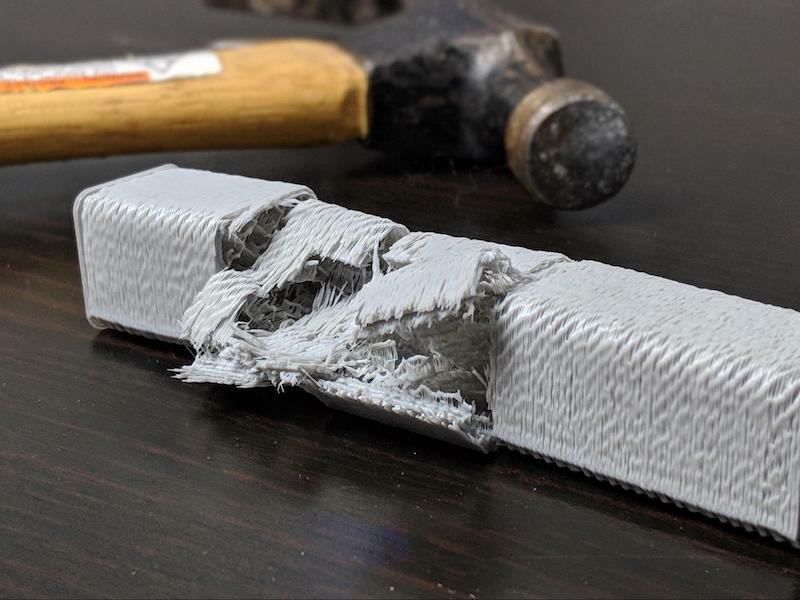 Example of a damaged PLA-built object. One of the biggest drawbacks to using PLA filament is that its a difficult material to post process. There is no way to chemically polish PLA parts unlike its competitor ABS. Therefore, if you want to remove print lines in parts or smooth their surfaces, you'll need to resort to sanding. The main issue in this instance is that PLA softens at a low temperature, around 60 degrees Celsius. As the parts soften, they will gum up sandpaper or start to develop an ugly white color. 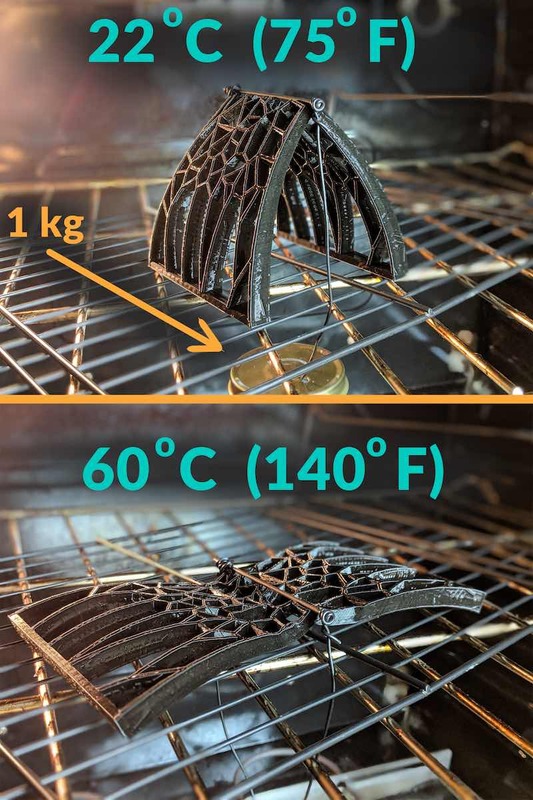 An example of how PLA materials can soften due to low temperatures. It's difficult to use power tools to sand parts because of the challenge in keeping the parts cool and solid. Instead, more users wet sanding by hand to finish parts. Note: Wet sanding involves sanding the part under running water or in a basin of some kind. Image demonstrating how to wet sand PLA-built objects. Wet sanding keeps the part cool while simultaneously washing away the debris created from sanding. However, the reduced friction of wet sanding compared with dry sanding means that your sanding job might take a while to get a fully polished part. Although printing with PLA filament is difficult and the post-processing is time-consuming, the material is easy to use. 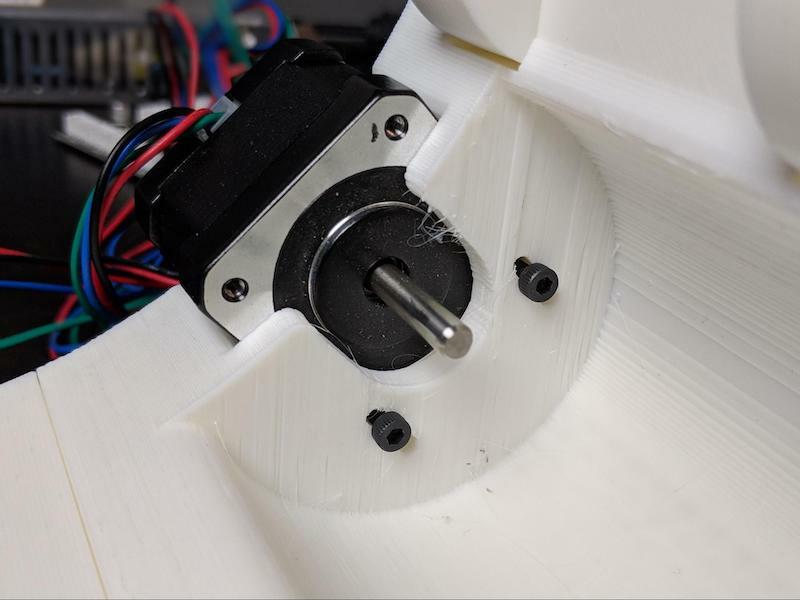 Even the most rudimentary 3D printers can create parts using PLA. PLA has a low printing temperature of about 205 degrees Celsius, so you won't need an all-metal hot end. PLA also doesn't require a heated bed because it warps very little as it cools. Furthermore, PLA emits very little odor. The only negative mark of PLA as a filament when it comes to usability is that PLA absorbs moisture from the air—which degrades its quality. So, it's highly recommended to vacuum-seal spools of PLA filament along with desiccant packets for storage. As mentioned earlier, PLA prints at a relatively low temperature compared to other types of filament. 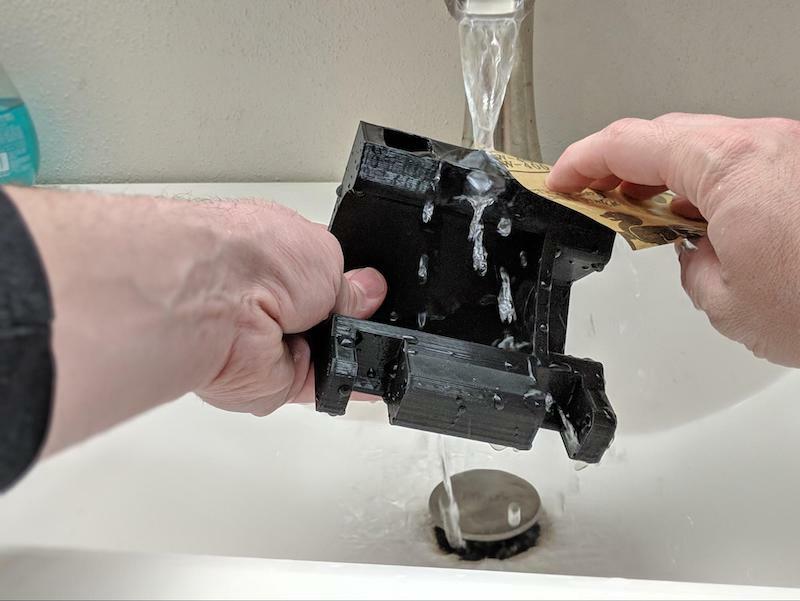 Of course, when it comes to 3D printing, some experimentation will likely be required to determine the best temperature level that works best for your printer. 3D printers are a bit like ovens in this way, each function a little differently. Printing at a high temperature can lead to blobs, stringing and a loss of detail in prints for example. Image detailing the ideal extruder temperature, bed temperature and bed adhesion settings or options for PLA materials. Setting the temperature too high can cause heat to migrate higher into the extruder, increasing the chance of clogging. While printing at a low temperature can cause the layers of your print to delaminate. They may not stick well together and the overall surface quality of the print can degrade in the process. 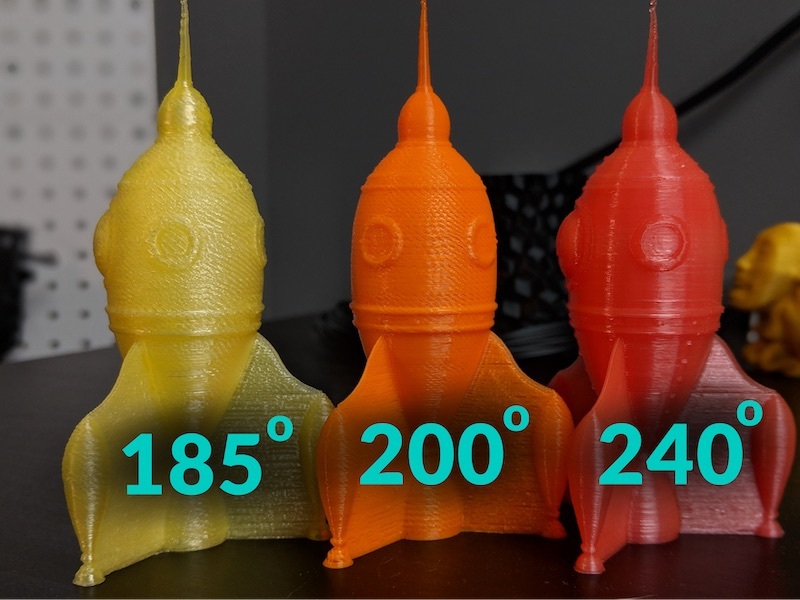 An image displaying the quality differences in PLA prints built with three different temperature settings. The Spiral Vase Rocket design used in this image was provided by gCreate (CC BY-SA 3.0). PLA can be used for smaller prints on a non-heated bed without issue, if you want to make larger parts, especially long, slender parts, a heated bed can help reduce warping. 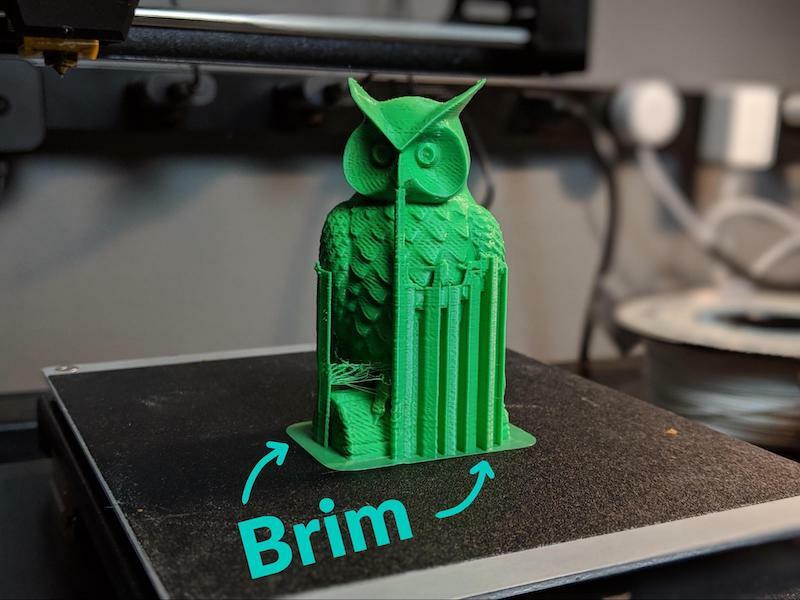 If using a non-heated bed, printing with a brim or raft can help improve bed adhesion. Owl statue made of PLA on a BuildTalk surface to aid bed adhesion. The own statue design used in this image is credited to cushwa (CC BY 3.0). Lastly, speaking of adhesion, PLA sticks well to painters tape. As long as the tape is replaced when its surface layer wears down, it works well as a first-layer adhesion with or without a heated bed. There are also many specialized bed coating products that work well for PLA too and don't require constant replacement. PLA is considered one of the best types of filament to use in beginner 3D printing projects because it's the easiest type of plastic to print. It also has the least demanding requirements so it can be used with low-cost 3D printers. Aesthetic prints turn out well using PLA because it prints them with a glossy, pleasing, finish even without post-processing. It's also generally easier to produce high-quality prints with PLA. PLA is a natural option for design prototypes because of its ease of use. Which allows teams to conveniently iterate on different versions of their product. Image of prototype print components made using PLA materials. PLA is particularly useful in functional prototypes as well, as long as the parts aren't subjected to large force or impact. For example, electronic housing, low-stress support structures, or low-speed gears all work well printed in PLA. Image of a practical, prototype, print using PLA materials.